Benjamin Rollo is a versatile musician with a magnetic passion for music. He’s an award winning drummer/percussionist, an accomplished classical pianist, a self taught guitarist and a respected singer-songwriter. He’s one of the most in demand session and live drummers in Canada. Rollo has performed and/or recorded with Steven Page (Grammy winner), Lucky Peterson (Grammy nominee), Peter Katz (Juno nominee), Kevin Breit, Danny Michel (Juno nominee), Jack Dekeyzer (Juno winner), David Wilcox (Juno winner), Russell DeCarle (Prairie Oyster - Juno winner), Ariana Gillis, Shawn Kellerman, Jordan John, Prakash John, Matt Schofield, Kevin Ramessar, Ellen Doty, Rob Szabo (Juno winner), Roxanne Potvin, Brian Macmillan, Ian Sherwood, Saida Baba Talibah, David Ross Macdonald, Matt Weidinger, Melissa Bel, Mike Todd, Jadea Kelly, Jaron Freeman Fox, Emma-Lee, Dee Dee & The Dirty Martinis, Scott Mccord & The Bonafide Truth, Paul James, Chris Assaad, Matt York Band, Dione Taylor, Nine Mile, Gavin Slate, Dawn Langstroth, Douglas Watson, Layah Jane, Soular, Dave Huber, John Mckinley, Corin Raymond, Vanyah, Beth Moore, Mike Erb, Greg McIvoy, Gene Hardy, Lumberjunk, Clara Lofaro, Mic Dainjah. Rollo has been featured on dozens of albums and videos with a variety of artists in Pop, Rock, R&B, Soul, Funk, Folk, Blues, Country, Jazz, Latin, Reggae, Singer-Songwriter and Classical music. He’s done sessions for television shows, radio jingles/ads, commercials and soundtracks. He has toured extensively throughout North America, Europe and Japan playing major festivals like Tokyo Jazz Fest, Montreal Jazz Fest, Winnipeg Folk Fest, Calgary Folk Fest, Tremblant Blues Fest and notable venues such as Roy Thompson Hall, Centre in the Square, Toronto Harbourfront Centre and more. Rollo’s original songs have been featured on CBC Radio and over twenty major radio stations across Canada. He has co-written songs with artists like Peter Katz (Juno Nominee), Giselle Sanderson, Mike Todd and Brian Macmillan. Rollo’s had an ear for music ever since he was a kid. He grew up with a professional singer-hammond B3 player for a Dad, a high school music teacher for a step-dad and an english teacher for a mom. He started piano lessons at age six and drum lessons at age twelve. 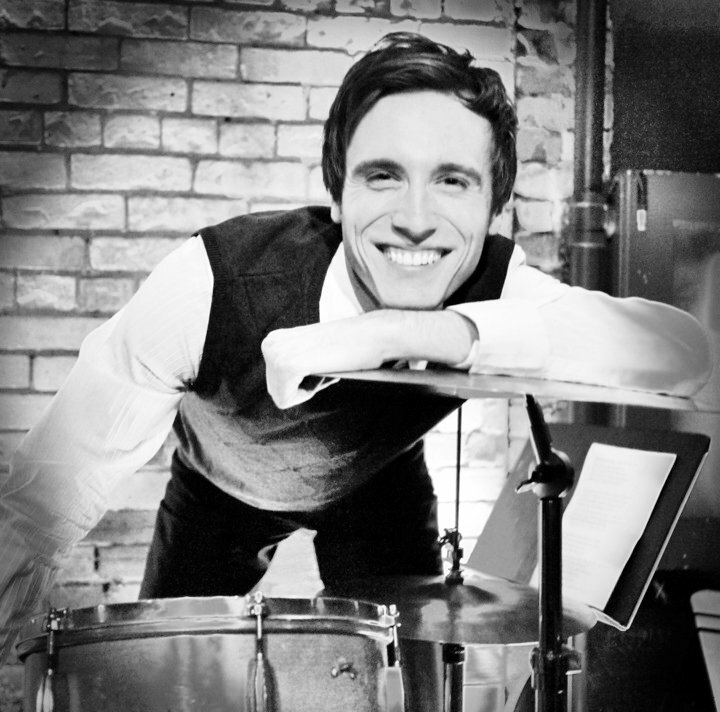 When he was in junior high he toured Germany as a percussionist with a high school orchestra. He was the principal percussionist for the Kitchener-Waterloo Youth Symphony Orchestra and was awarded the Archie Bernhardt Memorial Scholarship. By the time he was seventeen, he was playing bar gigs, conducting the high school jazz band, directing the high school musical and winning local music competitions. Before graduating high school he earned his Grade 9 Piano/Grade 2 Theory from Western Ontario Conservatory of Music. He went on to pursue drums at the prestigious Humber College in Toronto where he studied privately with Paul Delong (Kim Mitchell’s drummer) and Roger Flock. Rollo is known for his natural feel on the drums. He’s always listening and supporting other musicians around him with great time, precision, touch and tone. His instinctual sense of dynamics comes from his classical and singing background. He has command over the kit with power and excitement at his fingertips. Above all, he is a “song drummer”, always serving the song. Rollo can be creative in any situation and lives for the joy and freedom of the musical moment.